First two weekends of August got taken out by Space School, as always. We return to a (hopefully) more regular posting schedule with Victor Vran. 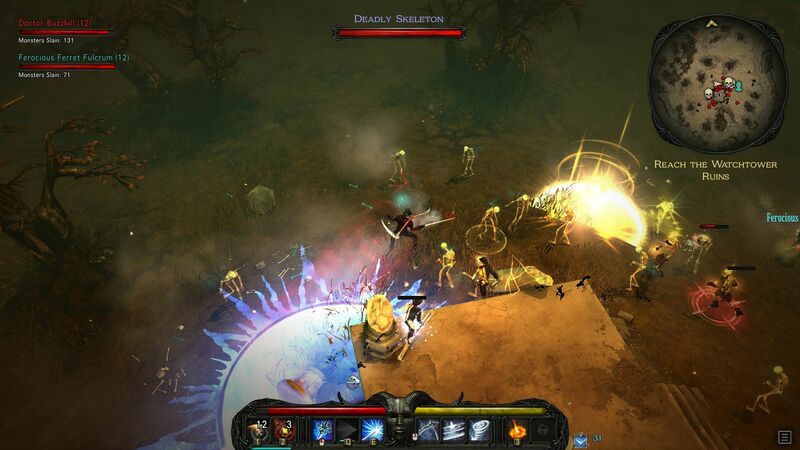 Victor Vran is a brand-new action RPG from developers Haemimont Games, previously known for taking on the Tropico series after PopTop imploded over a decade ago. Making an ARPG in the Diablo mold is quite a departure from their usual strategy-management fare, and Victor Vran has a decidedly budget look to it to boot (very much like the Van Helsing series, to the point where I initially thought it was the same developer) so I wasn’t exactly expecting great things from it, but it did have one very attractive feature: while it might have had a budget look, it also had a budget price tag that was reduced even further after I bought a two-pack and threw the second copy at long-time partner-in-mayhem Innokenti. Kenti: Sometimes I feel you can tell something about the calibre of the game by how much fun you can have endlessly repeating its name to each other. I am not sure if it means it is good or bad, but I think we’ve said Victor Vran an awful lot. The silliness of its name matches well with the general lighthearted approach the whole thing takes. Even if the intended humour falls flat on its face. Hentzau: I started pretty much every session by singing “Victor Vran, Victor Vran, does whatever a Victor can…” under my breath.